Have a long list of data to present to your boss or a client? Or maybe you just want to remember your parking spot number at the mall for once in your life. While this may not be a typical Smart Panda Labs post, we can’t resist sharing a fun and memorable (literally) takeaway from Opticon17, Optimizely’s annual conference. 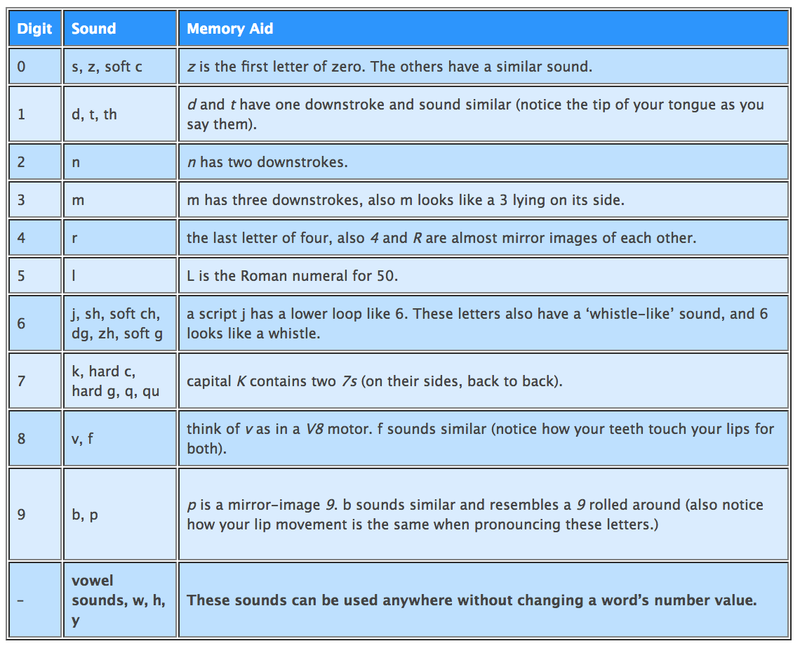 At the heart of the Major system is a 10-item mnemonic table (see below) to help you convert the digits 0-9 into corresponding sounds, which we’ll eventually use to form words. If this looks a little baffling at first, rest assured that is takes only about 20 minutes to memorize. And once you’ve got it, you can use it forever. As you can see, each digit can be assigned a letter or sound. The number “23,” for example, maps to the consonants, T and N. To create a word around the consonants, the other letters should be vowels or vowel sounds (w, h or y), or silent letters (like the “b” in “debt”.) Note that the conversions are strictly phonetic and thus based on how the words sound—not how they’re spelled. For 23, TowN is an example of a word that works. There are obviously many possible permutations here, including teen, tan, and tin. But town seems like the best choice, as you should aim to use words that are easy to visualize. Concrete nouns—such as objects or animals (PaNDa is 921! )—always work better than abstract nouns, adjectives or verbs. Here is another example. Say you need to remember yesterday’s website bookings—47—for a meeting. 4=r and 7=k/q sounds. RaKe is a simple word that works. So now I’m imagining literally raking in a pile of dollars from the bookings. Maybe you also need to remember total revenue for last week’s website activity—$9,538. Longer numbers like this can be broken into multiple words, so let’s split this number into 95 and 38. 3=m, 8=v or f. Second word could be MoVie. Once you have multiple words to remember, you can begin to craft a story. The more interesting or wacky the story, the better. Imagine swimming in a PooL on a cruise ship with a MoVie playing on the deck. If you have a lot of numbers to memorize, or fantasize about performing some serious party tricks, the Major system ties perfectly to another technique that has been used since ancient Rome. Known as the Memory Palace technique, it’s responsible for some incredible memory feats. Eight-time world memory champion Dominic O’Brien, for instance, memorized 54 decks of cards in sequence (2808 cards! ), viewing each card only once. A “Memory Palace” is a metaphor for any well-known place that you’re able to easily visualize, like the inside of your home or your daily route to work. The more vividly you can visualize the details of that place, the more effective your memorization will be. You’ll take a mental walk through your palace, mapping words to your journey at every step. The key is to construct a scene that is as wacky, nonsensical, lewd or grotesque as possible. Experts in this technique warn that if it’s boring, you’re doing it wrong. You want to cater to your mind’s propensity to latch onto the absurd. I walk up to my front door to a MouSe in a top hat, who opens the door for me and greets me in a British accent. We walk into the entryway together, and he puts his top hat onto a NaiL to hang it. As we walk past the living room, I trip over the rug and hit the ToeS on my left foot on the coffee table—ouch! As I’m hopping into the kitchen to get ice for my foot, I run into the kitchen wall and hit my NoSe, which starts to bleed. While this may seem like a lot of effort just to memorize these numbers, it becomes a speedy brain activity with practice. And once you’ve committed to your Memory Palace narrative, you’ll be amazed at how quickly the numbers come to you. It’s also helpful to have a pre-defined word list for numbers 0-9 and 00-99. As you use the same words over and over again, you will be able to retrieve the numbers from your memory bank faster each time. With a little upfront effort and some practice, you’ll soon be the star of your business meetings—or a very memorable party guest. In the major system, each digit from 0 to 9 is matched with a group of similar consonant sounds. The conversions are strictly phonetic and thus based on how the words sound—not how they’re spelled. This technique makes it very easy to do the translation from words to numbers in your head because you don’t have to worry about how the word is spelled. The Major system ties perfectly to the Memory Palace technique. A Memory Palace is an imaginary location in your mind where you can store mnemonic images. The most common type of memory palace involves making a journey through a place you know well, like a building or town. Once you’ve mapped your words to your memory palace, you’ll be amazed at how quickly you will be able to retrieve these words—and the numbers they represent—from your memory bank. Jessica is an analytics + intelligence expert who applies her strong analytical skills and expert-level knowledge of digital marketing and analytics software to make recommendations and drive value for smart panda’s clients. She was previously the Manager of Web Analytics & Intelligence for Marriott Vacations Worldwide and the primary analyst for DisneyWorld.com, where she was responsible for advanced segmentation analysis, A/B testing, campaign measurement and conversion reporting for large ($500k+) projects. Jessica also worked as an analyst of interactive systems for NBC Universal.